* If you have any trouble with the online purchase, please call Lisa at 613-400-1511 to order over the phone. An Eastertide Messiah with the Caelis Academy Ensemble and orchestra, directed by Matthew Larkin. This concert features Parts II and III of Handel's most famous oratorio: Messiah. 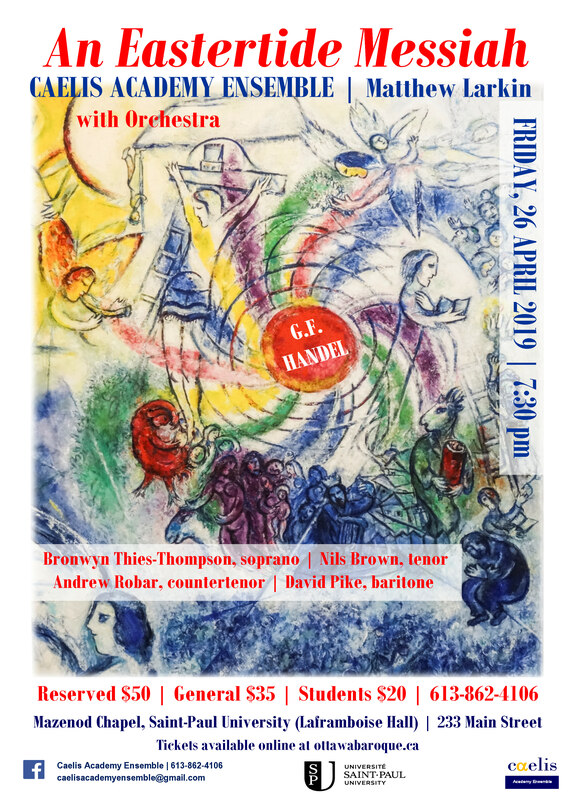 It takes place in a month's time, on Friday April 26th at 7:30 PM, and we are delighted to welcome Soprano Bronwyn Thies-Thompson (who sang with us in Bach's St. Mark Passion last season), Countertenor Andrew Robar (St. Mark Passion, Bach Magnificat, Handel's Israel in Egypt), Tenor Nils Brown (appearing for the first time with Caelis), and Baritone David Pike (Finzi's In terra pax, also last season). Seating is limited in the Chapel, so ordering online in advance is recommended.